The day of the puncture may soon be over. No more changing your wheel on the side of the road in the rain, no more spare wheel in the back and no more tire maintenance. 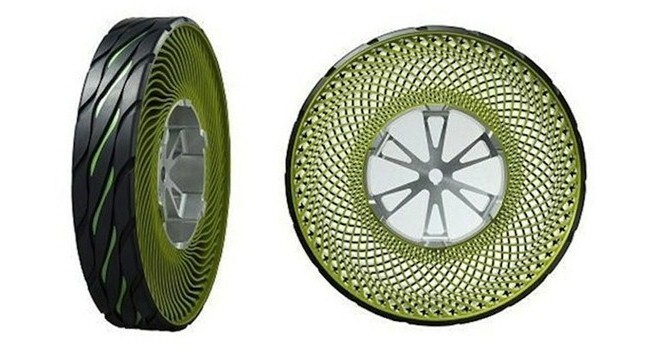 While there have been concepts of airless tyres around for a little while, none have actually been available for purchase, so the public has only been dreaming of the day when punctures can become a thing of the past. But as soon as next year, airless tyres could become a reality for the average driver, making cars really take on that futuristic look that we’ve all been waiting for. From the big-cats at Michelin and Bridgestone have come out potential designs for airless tyres, both of which use a wheel and tyre combo to achieve the airless factor, and Bridgestone even says that its tyre is more environmentally friendly than the old doughnut that we’re all still riding on. But where are they? It will take an immense effort to design these new systems for every car out there. Still, with all the other incredible advancements in the auto industry, it’s about time a production version of airless tyres was released. The whole industry of the airless tyre is really interesting, needing to take into account factors like the pressurization of normal tyres and the suspension element, not to mention the need to be strong enough to flex and not break. Basically, tyres need to have some give in order to stay on the road; they can’t be stiff and inflexible, otherwise the car will lose a crucial suspension element to the ride, affecting performance. To achieve this, a concept close to a bicycle’s wheel is implemented, having a complex design of ‘spokes’ from the hub to the outer strip of ‘tyre’. Bridgestone’s tyre is 100% recyclable thermoplastic resin for the construction of its spidery kaleidoscope wheel. It is a lot denser a design than Michelin’s, the latter looking more like a racecar’s wheel with super low-profile tyres. It is called the Tweel; obviously mixing tyre and wheel, and just about as cheesy as it can get. 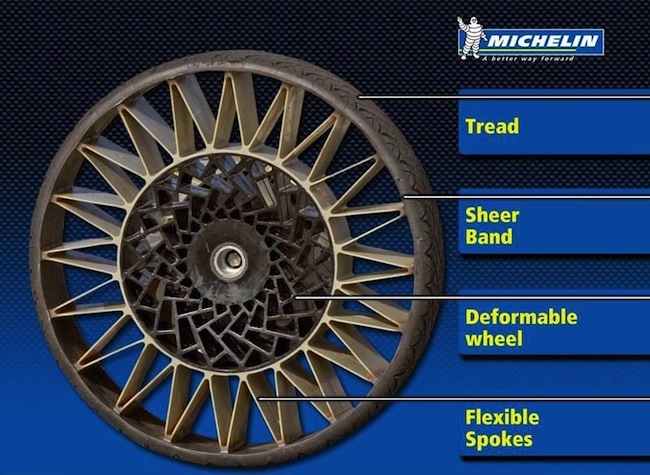 It implements polyurethane and glass-reinforced plastics for its construction and Michelin say that lateral stiffness is increased and handling response is good, but once the Tweel is produced, the set stiffness of the spokes cannot be adjusted. So one would have to be wise in the decision of what they want from their tyres. My question is: what happens when the tread runs out? Do you need a whole new Tweel? And now, finally, you may be able to pimp out your ride with the biggest thing since spinning wheels. 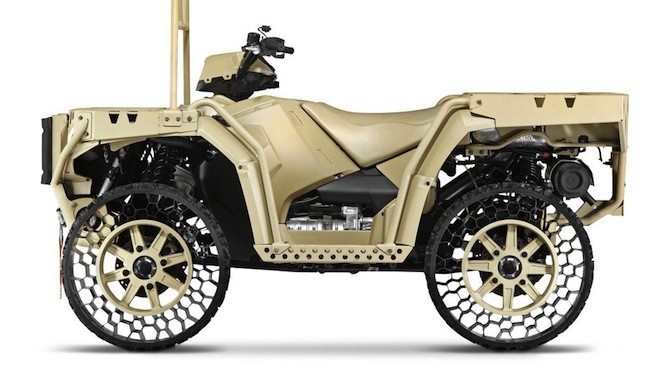 Polaris, an off-road specialist, has now produced an airless tyre that will be made available to the public from 2014. That’s next year, motor enthusiasts. Ok, so not quite made by Polaris, but by the recently acquired Resilent Technologies; it takes the basic idea from Bridgestone and Michelin and makes it its own. And, might I add, that the name Non-Pneumatic Tire is monumentally better than Tweel. It was originally made for military purposes, being able to withstand a bullet without — you guessed it — going flat. Soon, though, you may be able to install it on your road-going ride, and can avoid getting your tyres shot out by the police. Bank robbers will love these. Because the wheel has to be flexible and act in a way like a traditional tyre, strength is a major factor. Imagine, instead of getting a puncture, you break a wheel. That’s a whole wheel to replace; not just a tyre. And don’t think these things will come cheap because, like all new and fancy technologies, it will be astronomically expensive. The mesh structure is significantly simpler than Bridgestone’s, and I think that it will be very interesting to see how the different designs of all the airless tyres affect performance. The outer tread is still rubber, which is good, because finding a new material to take on the challenges that rubber has succeeded in tackling is another task entirely. But the problem comes, like I said, when the tyre wears out. Will there be a replacement strip to put on, surely that would be necessary? 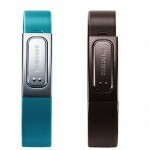 There are still many issues to work out which explains why we haven’t been able to play around with this new tech yet. But it really can’t come out any sooner.